The long, lazy days of summer are here. Hours to laze around and work on my art ~ Paint outdoors, sketch by the lake and maybe try some new techniques. Now that's some Wishful thinking on my part... [caption id="attachment_5594" align="aligncenter" width="560"] making collage papers[/caption] You would think I would be getting lots done over here, but truth be told I am accomplishing little. It is sweltering hot, the lake is calling,the dog needs to be watered, the kids need to get to camp and work and all the visitors need to be tended too. Do I dare say I have having a lot of fun despite the compelling urge to sit down and work at my art? 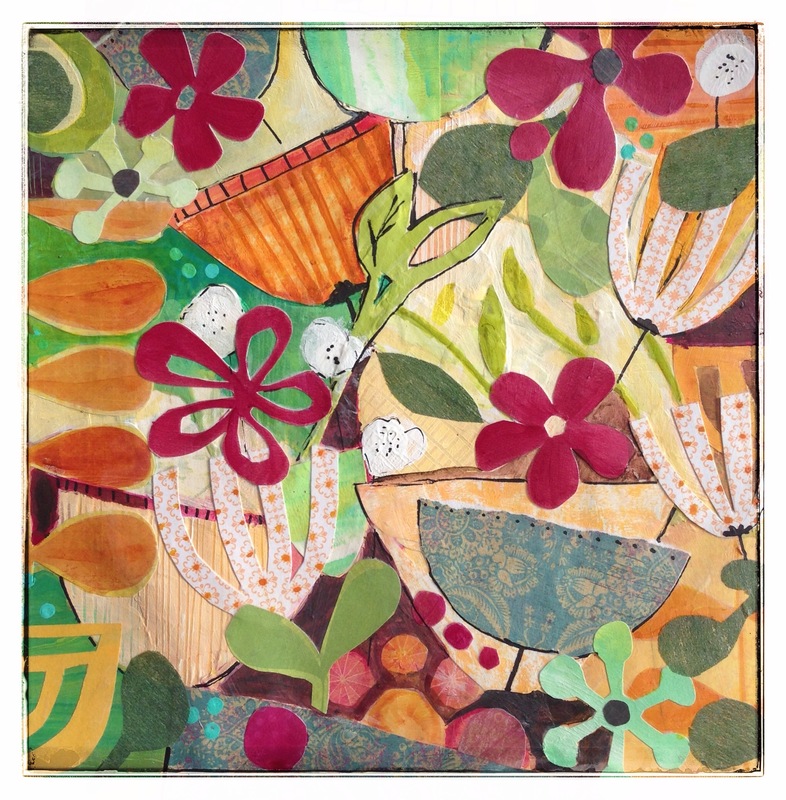 [caption id="attachment_5595" align="aligncenter" width="560"] intuitive collage - working with what is presented[/caption] I have just recently finished Mati Roses Daring Adventures in Collage. It really helped inspire me to start working with mixed media again. 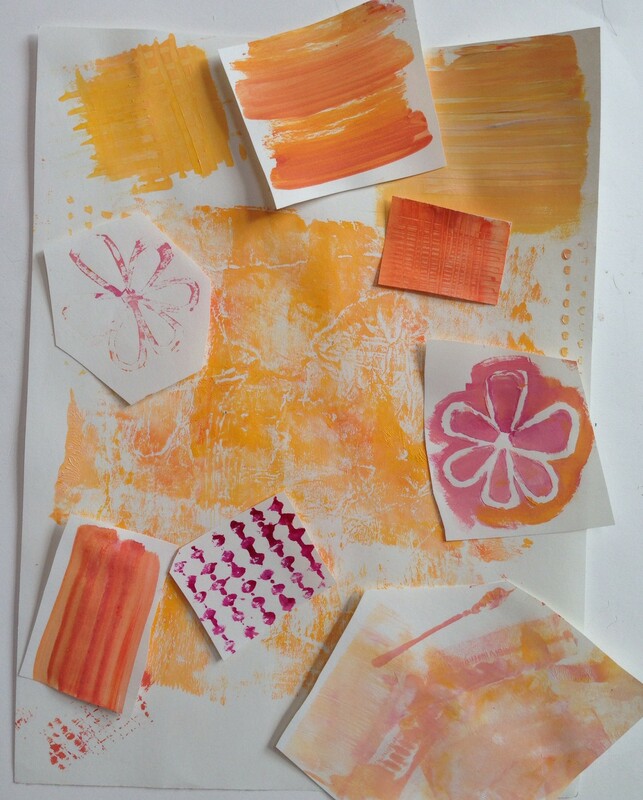 I just love the combination of paper,paint and ink. There is something about it that makes my heart pitter patter. I love all the texture and pattern, with a little this and that peeking through. I love getting my hands dirty. 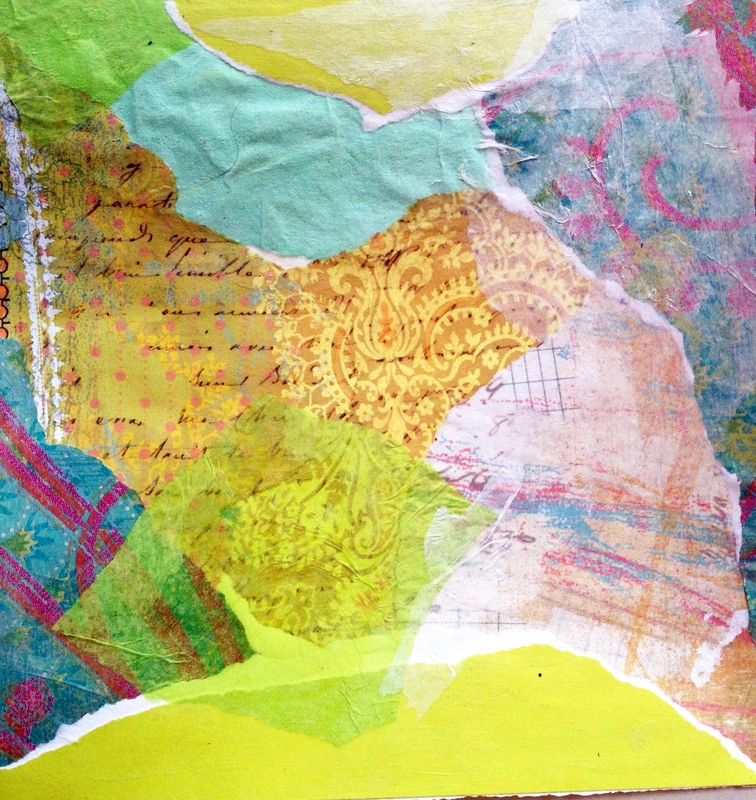 I am not sure which is more fun - making handmade collage papers or creating the actual collage itself? I have approached this round of work a bit differently than before. I am now working on paper -Borden & Riley sketch vellum - which is a heavyweight, rather indestructible, paper for mix media. 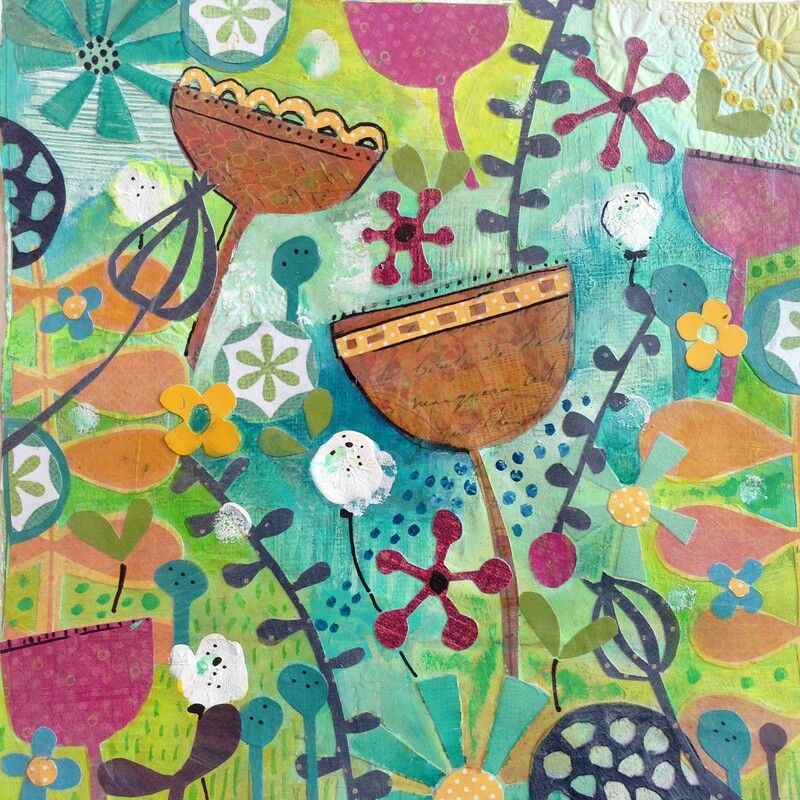 This allows me to cut, paint, spray and stamp to my heart's content without stressing over another unfinished canvas. It's only paper and can either be recycled or cut up for another collage project. If I like it then it is easily affixed onto a wood cradled panel. 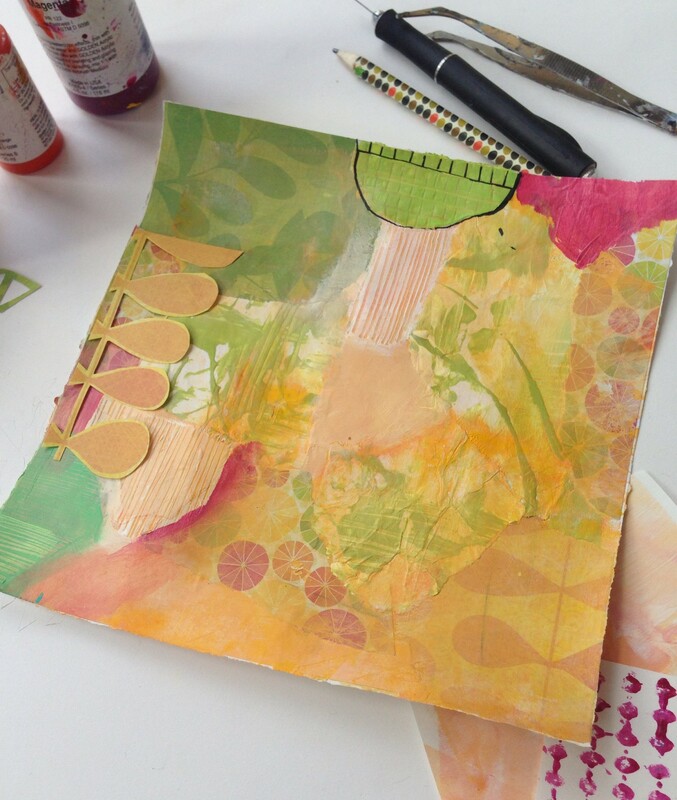 [caption id="attachment_5568" align="aligncenter" width="560"] collage - lots of layered paper. Adding paint next! [/caption] This time around I am also working small. Very small for me. All pieces are 8 by 8". I decided to go this route because I find them easy to complete in a day and easy to have many on the go at once. I have a plan for all of these pieces, but that will be unveiled later.I am not trying to be secretive, just deciding what the best route is for these. A plan is in the makin'.. What I do know about these is that they are a part of my everyday creative life. They keep me playing and trying new techniques which only help spark my imagination and creativity. I am hoping to be back here soon, but not making any promises. I am just a passenger on this free wheelin' ride called summer. (even I am rolling my eyes at that one ;) Enjoy every moment of yours!